Bonus question : how long is the longest tunnel between on the given route? EDIT: I want to avoid tunnels because I am claustrophobic and hate them. I can tolerate short tunnels (>1000 -1500 m). Before I rule out travelling by train I just want to be sure if there is a route without tunnels that exceed let's say 2000 metres or not. You can't do this entirely by train avoiding long tunnels, but you can take a combination of trains and buses, essentially take trains to the foot of the Alps, buses across the big passes, then get on the train again on the other side. This will be much easier in summer than in winter, as most passes are closed in winter. In either case it will require extensive planning, a long time, will probably cost more, and will give you lots of scenic views. Train Milano–Scuol (6 hours), bus Scuol–Landeck (1½ hour), train Landeck–Munich (3 hours). Three tunnels >1500 metre, longest tunnel 2350 metre. The only railway that crosses from the Italian side to the German side of the Alps without a big tunnel is the Bernina railway connecting Tirano (Lombardia, Italy) to St. Moritz (Graubünden, Switzerland). The longest tunnel on this railway is 689 metre and it runs year round. You can get from Milano to Tirano via Lecco and Sondrio along the Tirano-Lecco railway which does not appear to have any major tunnels has tunnels, but there are alternate routes without, see jcarons answer. From St. Moritz, you can take the train to Scuol. This section has 16 tunnels, including 3 that are longer than 500 metre, all along the 9 km between Guarda and Ftan. The longest is 2350 metre. You might be able to avoid them by switching to a bus at this section. The railway ends in Scuol, from here you'll need to switch to a bus to Austria, where the railway continues from Landeck. The shortest and fastest car route between the two places is tunnel free. From Landeck, you can continue by train. To get to Innsbruck along the Arlberg railway, there are two tunnels. The longest, the Zammer tunnel, is 2335 m and is immediately east of Landeck. Again, you might be able to avoid it by bus. From Innsbruck, there is a scenic railway to Garmich-Partenkirchen, bu the Mittenwald Railway does have 16 tunnels, including 2 that are longer than 500 metre, the longest being 1810 metre. From GAP you have reached the north side of the Alps and can continue by train easily. Direct trains avoiding this route now anyway take the New Lower Inn Valley railway which is mostly built in tunnels, but local trains via Rosenheim might take the old mostly tunnel-free track — check this carefully. From Rosenheim it's easy to reach Munich. Alternately, you can take a train to Airolo, then take a bus over the summit of the pass to Göschenen (summer only), and get back on the train from there, having reached the northern side. Be careful in your planning, most buses take a tunnel. There are still tunnels on the connecting tracks, so you'd have to see if you can handle those or if you can avoid them with a bus. You might find a year-round alternative by taking the train to Domodossola, a bus over the Simplon Pass, then a train from Brig via Martigny to Basel. You will probably have to make some extra changes and detours in northern Switzerland to avoid further tunnels. If even short tunnels are not an option due to claustrophobia, then taking the train is probably not a realistic alternative. Even roads will have short tunnels. You may be able to find a route by road that avoids any short tunnels, making big detours where they do happen, but it would be a long journey. I did not cover in this answer the trains from Rome to (for example) Milano. I remember the fast trains having lots of tunnels. I did not take the slow train. You've talked about length, but consider: at 240 km/h, a 2 km tunnel will take 30 seconds to cross. Is it the length or the duration that triggers claustrophobia? For your specific route, look up the Wikipedia articles describing the railway section. On the right, unfold the section where it says "Route map". This often mentions all tunnels, certainly if they are longer than a few hundred metre. You can also follow the track on Openstreetmap, Google Maps, or Google Earth and look for tunnels that way. Only you can finally judge what is acceptable for you or not. Good luck! Inspired by @gerrit's answer, this one has one tunnel that is 5865 m long (and can be avoided with a 30 minute bus ride), but otherwise all other tunnels are much shorter. Roma-Firenze-Bologna-Milano: you will probably have to take regional trains, as the high-speed line has many tunnels: Roma-Firenze has 5 tunnels over 3 km (longest 10.5 km), Firenze-Bologna has 7 tunnels over 3 km (longest 18.7 km). Bologna-Milano seems to be relatively devoid of long tunnels. I won't go into details here as there are probably many different options depending on how much sightseeing you would like to make. Milano-Lecco: via Carnate: 2 tunnels (2228 and 2242 m), or via Molteno: no tunnels apparently. Lecco-Tirano: 6 tunnels, but the longest is 1395 m.
Note that you can ride from Milano to Tirano directly, but that will take the line via Carnate with its two 2.2 km tunnels. Tirano-St Moritz (Bernina Railway): 11 tunnels, but the longest one is 689 m. UNESCO World Heritage site. St Moritz-Thusis-Chur (Albula Railway): over 40 tunnels, but only one is significant, the Albula Tunnel which is 5865 m long. The second longest is only 698 m, and many are just a few couple dozen meters long. UNESCO World Heritage site as well. The whole Tirano-Chur stretch can be done with a single train, the Bernina Express. If you want to avoid that single tunnel, you can use a bus from La Punt-Chamues-ch Railway Station to Preda Railway Station, it goes over the Albula Pass, takes less than half an hour, but only runs from end of June to end of October. From Chur, there are several options, the simplest one involving just one change at St. Margrethen. There do not seem to be any tunnels around, but I haven't checked extensively. 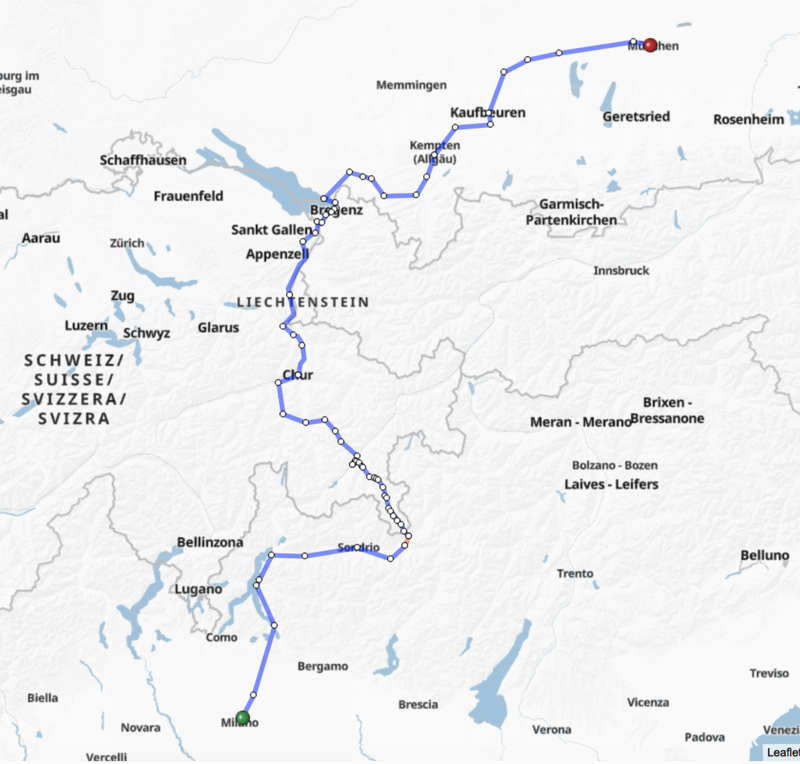 Note that if you check itineraries on the CFF/SBB website (the Swiss Federal Railways), you can view the full route on a map, and once you zoom in enough the (OpenStreetMap-powered) map will show you tunnels. Final note: whether you take the train all the way or use the bus to avoid the Albula tunnel, it will take you quite a while to do the whole trip. But you will have some incredible scenery on the way! Since the highly upvoted and currently accepted answer involves buses, a slight change in transportation mode seems to be acceptable. Therefore I suggest flying. Looking several weeks out, Lufthansa has several offers for under 90 EUR round trip with nonstop flights of about 90 minutes each. Even with getting to and from airports and passing security, that trip is well under a day. The first one I checked is scheduled to use an Airbus A319 and Airbus A321-100/200 for the routes to and from respectively. The inside of the plane cabin might be bigger than the inside of a train or bus, and the specific seat area might be comparable to a bus (maybe more area if you pay more). Actual costs will depend on when you want to go, when you're booking, and a surprisingly large variety of other factors. Planes do even worse than you in long tunnels, so you're not likely to have any of those on the flight. The reduced remaining challenge is getting between the airports and your origin/destination without long tunnels, which seems likely easier, though the question doesn't have enough information for us to address that. Challenge accepted. Since you posted the question of how to get to Budapest from Munich a while ago (How to avoid the huge tunnel at Vienna when travelling from Munich to Budapest by train? ), I will take it from there. You can take the train as described until Vienna. I suggest doing this on day 1, so that you can spend the night in Vienna. This is because I will now take you through Slovenia into Italy. There is only one viable train going to Trieste from Vienna which leaves Vienna at 7:58 in the morning and gets you to Trieste with a change in Ljubljana (takes 10:55 hours). Then you can take trains as described in other answers to Rome. I doubt you will make it on that day, though. Make sure to go via Graz and not via Villach since this will mean a lot more tunnels. The line from Vienna to Trieste only sees one bigger tunner, the Semmering tunnel which is 1500m long. Otherwise there are only few short tunnels. So the route is (Munich - Wienerwald tunnel bypass -) Vienna - Graz - Ljubljana - Trieste (- Bologna - Rome). If you want to take this further, you can even go to Budapest and take the daily train to Ljubljana from here. This avoids any tunnel on the route (Budapest-Trieste is 14:33 hours). This would be the shortest way around the Alps avoiding long tunnels. None of the options will allow you to make it in one day, though. In case the comments to the question disappear if the OP is happy to pass through tunnels while asleep the NightJet from Roma Termini leaves at 1858 which for most of the winter is dark and arrived at München Hbf at 0819 the next day. It would be best to book a single sleeping compartment so you can be sure you can pull the blind down to avoid seeing anything while passing. Of course this will not work if it is the knowledge that one might be in a tunnel which is the trigger rather than knowing one actually is. You could avoid the Alps and their consequent long tunnels by going Milan-Nice-Lyon-Strasbourg-Munich. I haven't researched the details of the tunnelling on this route, but there aren't any large mountains to tunnel under. (Lots of short ones though). Not the answer you're looking for? Browse other questions tagged trains italy austria or ask your own question.